Mr Hansraj G Ahir, Member of Parliament from Maharashtra, at the request of ELTF, took up the problems faced by the students while availing education loan with the Prime Minister and Finance Minister on 4th Sep 2013. 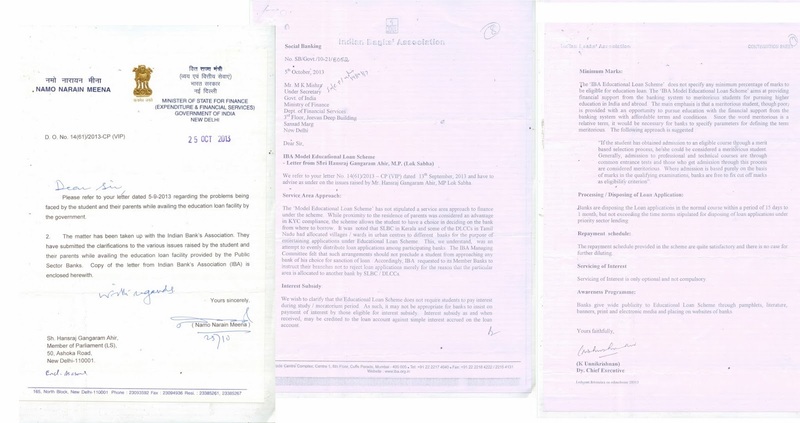 Now MOS (Finance) has responded to Mr Hansraj attaching the comments from Indian Banks Association. As per IBA, the banks should not refuse loans citing service area. Also, the eligible students need not pay any interest to the bank during the study period and moratorium period. The banks are required to communicate the decision within 15 to 30 days. If the students get admission through common merit based admission process (like Anna University Counselling), banks should not insist on minimum marks. Please go through the communication from IBA for more details, by clicking on the image posted above.